Three courageous women head West to find true love! Follow along as each of them overcome hardship and ultimately find the love they were searching for. Thanksgiving & Forgiveness - Jeannine has left everything, including a checkered past, behind to start a new life in Ruby Ridge, Wyoming. She arrives just in time for the town’s Thanksgiving Celebration . . . and a lot of unexpected drama. Christmas Bride - After arriving in Ruby Ridge in a snowstorm, Jenny embarks on an adventure to find her missing husband-to-be. Her quest to find her husband is full of surprises and new friends but Jenny eventually gets to be a Christmas Bride, just not in the way she had planned. Valentine’s Day Surprise - Bethany has left behind the security of life in New York to find love and adventure in Ruby Ridge, Wyoming. Her journey is full of surprises and biggest one will change everything. 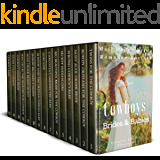 This is a collection of a sweet, clean, western, historical, romance short stories. Each one is a complete story. Be sure to read them all - in any order! There are three stories in this set. My opinion is that this is a good set of stories. It’s not without some issues but still worth the price! Thanksgiving, Christmas and Valentine's are good times for Mail Order Brides to meet the love of their lives and to begin their new future together. It is a clean, sweet mail -order bride story. 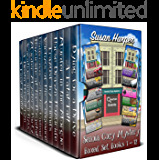 The plot is simple and the characters a little stiff, but the reading is entertaining. As with all her books, this is a clean and sweet set of love stories. You'll never be disappointed in her books. 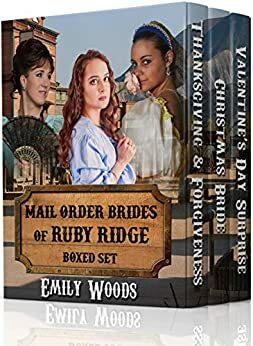 5.0 out of 5 starsBrides of Ruby Ridge set. I really enjoyed the stories of Brides of Ruby Ridge. It was like going back in time and seeing what they might have gone through in those days. Very good.